Persistence Market Research uses a unique research methodology which is a strong blend of secondary and in-depth primary research. Extensive primary interviews with key market players, stakeholders, market observers and experts are carried out to collect necessary data and information pertaining to various segments and across key regions. The data crunching and statistical analysis so performed undergoes multiple layers of validation to garner appropriate market insights which could benefit business by impacting critical decisions. The exhaustive research methodology has been applied to thoroughly understand and study the market for flexible plastic packaging and the findings and insights have been skilfully crafted following a systematic structure in the new report titled “Flexible Plastic Packaging Market: Global Industry Analysis (2012-2016) and Forecast (2017-2022)”. The market research report on global flexible plastic packaging is a comprehensive market research study which focuses on the global market scenario and provides actionable acumen on various factors which influence the market which is possible with the help of strong data and statistical analyses. It delivers an unbiased view of the market by including analysis on various market segments across the major geographies of North America, Latin America, Europe, Japan, Asia-Pacific excluding Japan (APEJ) and Middle East and Africa (MEA). 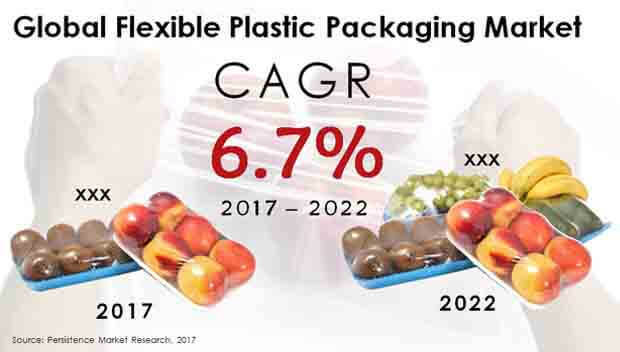 The global research report on flexible plastic packaging market has in-depth weightage on statistics, figures, numbers and graphs which is based on a clear market definition. This will enable the reader to take informed decisions with the help of well-furnished insights. The upcoming trends and developments, new innovations in products and varying product portfolios, new acquisitions, end user analysis and much more actionable acumen give a 3600 view to the market ultimately providing the reader with necessary tools to devise strategies in order to establish firm grip in a particular region or in a particular segment in the global flexible plastic packaging market. The global flexible plastic packaging market research report covers competitive landscape, which covers the market shares, revenues, growth strategies applied, product portfolio analysis, distribution channels, expansion in several geographies, marketing strategies, SWOT, pricing analysis, etc., of the various key players in the global flexible plastic packaging market. Such an intelligence framework can be used to devise appropriate strategies in order to gain competitive advantage in the long run. Flexible packaging is one of the growing trends in the packaging industry. Flexible plastic packaging involves various types of plastic material used for packaging of different products. The type of material to be used in packaging depends upon the application and type of product to be packaged. Generally, plastic material such as Polyethylene, Polypropylene, polystyrene, polyvinyl chloride etc., are used in flexible plastic packaging. Flexible packaging is considered to be the most convenient and economical way to preserve, distribute and package food items, beverages, pharmaceutical products and several consumables. In a way, flexible plastic packaging ensures a prolonged shelf life of the products that helps in efficient distribution and minimizing losses. Persistence Market Research has come up with an exhaustive, insightful research report on plastic flexible packaging market by studying various market components that have an influence over the growth of the market on a global basis. These components include various trends, macroeconomic factors, developments and innovations that have a fuelling effect on the growth of the market as well as a restraining impact. The impact analysis covering these factors delivers value with which new strategies can be devised with a view to overcome hurdles in the market and look forward to future expansions. The report also gives a glimpse of the future market scenario, with forecast projections for five years, from 2017 to 2022. According to Persistence Market Research, the global flexible plastic packaging market is expected to grow at a robust CAGR throughout the period of forecast, and is estimated to reach a value of around US$ 202 Bn by the end of 2022. By Pack type, the sachet and pouches segment reflects a high potential from revenue as well as growth perspective. This segment, since 2016, has contributed towards the overall growth of the global plastic packaging market. According to the research study, sachet and pouches are expected to continue to grow at the highest rate and also estimated to portray a high revenue share in the global market space, thus pushing the growth of the global flexible plastic packaging market. This segment is poised to register a high CAGR of 7.7%. To add, this segment is anticipated to show a high BPS by 2022 end. BOPP material is extensively used in flexible plastic packaging. This segment, since BOPP is largely used in packaging of potato chips, reusable woven bags for shopping, used in layers in packaging of various snacks, in labels and wrapping films, is projected to grow at the highest CAGR of 10% throughout the forecast period 2017-2022 and expected to gain a high BPS by the end of the forecast period. Conversely, the polyethylene segment by material type is expected to continue to preserve its status quo as it shows high market share in 2017 and is expected to continue with this trend during the 2017-2022 timeline. It enjoys a high market share as it is widely used in packaging of several FMCG products such as beverages, foil pouches, in metallized lids used for packaging of yoghurt, in confectioneries, carton windows etc. in 2017, the polyethylene segment reflected a high 50% market share in the global flexible plastic packaging market. The global flexible plastic packaging market research study focuses on various key players involved in flexible plastic packaging industry. The research study covers various factors of the key players such as company overview, SWOT analysis, product portfolio, key financials and developments. Key players such as Amcor Ltd., Bemis Company, Inc., Sealed Air Corporation, Berry Global Group, Inc., Mondi Group plc, Sonoco Products Company, Huhtamaki Oyj, Constantia Flexibles Group GmbH, Ampac Holdings LLC and Bischof & Klein GmbH & Co. KG are profiled in this research report.